I was recently contacted by Michelle Pino. Michelle has recently taken an interest in what inspires others to live a healthy lifestyle. With her knowledge of health and wellness, people tend to ask her what she does to stay healthy, so she figured a guest post on my blog would be a great opportunity to share her knowledge with others. This first word emphasizes your need to ensure that your goal is clear. To make your goal clear or specific, make sure that it addresses questions like: "What am I trying to accomplish?" and "Where will I complete it?" This second word represents your need to develop clear criteria that enables you to measure your progress as you work towards your goal. The thought behind establishing a measurable goal is simple: If your goal is not measurable, you have no objective criteria through which to determine whether your current activity is contributing to or detracting from you accomplishing the goal. To determine whether your goal is measurable, ask yourself if it answers questions like How much? and How will I know when it is accomplished? This third word represents the importance of ensuring that your goal is realistic. This does not mean that the goal doesn't involve work. Indeed, it can require that you work hard to achieve it. At the same time, however, it should not be too extreme. Once you establish an attainable goal, you enable yourself to cultivate the abilities, financial stability, skills, and attitudes necessary to accomplish it. The fourth word highlights the fact that your goal has to matter. An example of a goal that couldn't meet this criteria when one is trying to lose ten pounds would be "I'm going to study three hours each week to bring up my Chemistry grade." While this goal is specific, measurable, and attainable, it is at best only tangentially related to the task of losing ten pounds. To determine the relevance of your goal, make sure that it can answer yes to questions like "Does this seem worthwhile?" and "Is this the right time?" The fifth word emphasizes the importance of giving your goal a target date. For example, if you decide to eliminate french fries from your diet, will you begin abstaining from the food in one week or will you gradually decrease your consumption of the nutritionally void item over the course of a month? Making your goal time-bound is important and effective because doing so enables you to focus on completing the goal either before or on the established due date. Although many people have challenges establishing and completing health-related goals, using the SMART goal guide can help turn your dream of being healthy into reality. May is National Physical Fitness & Sports Month, which makes for a great time to get out and get motivated! Try creating your own inspiration board to help get on track. 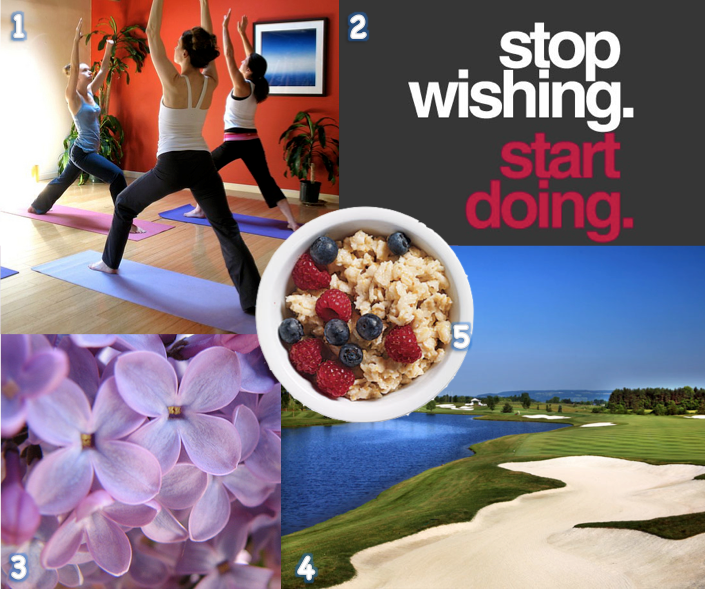 Use images and quotes that inspire you to live a healthier, better life. As you move towards your target, your goals may change or expand. Take time to update your fitspiration board whenever it feels out of alignment with your aspirations. Make sure what is on the board is what you really want. Taking the time to create and maintain a fitspiration board is a fun yet powerful way to keep you motivated on the path towards the fit lifestyle you’re yearning for. Thank you, Michelle for sharing these tips! If you would like to contact Michelle personally, you may do so by emailing her at PinoMichM@gmail.com.